Everyone needs to know the basic crochet stitches first – so in case you visited this post looking for those basic ‘must have’ stitches – fear not! I’ve included links for the Basic Crochet Stitches at the end of this post. 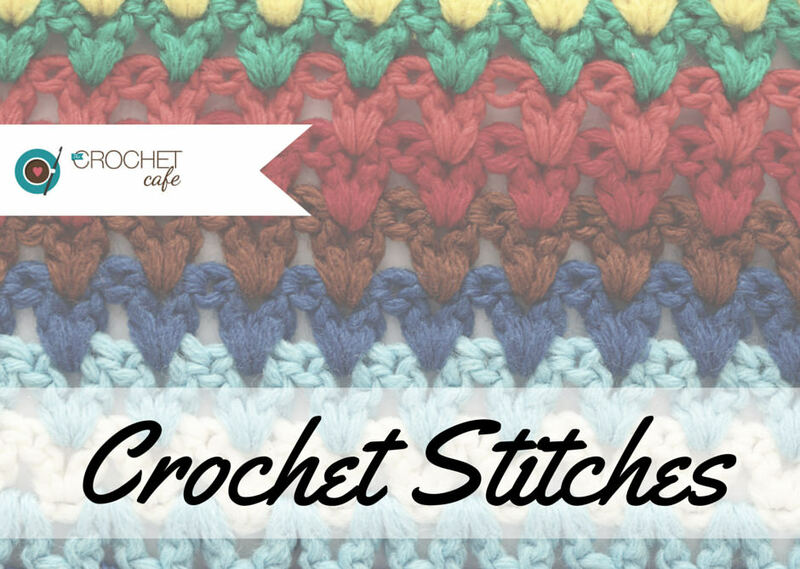 With so many crochet stitches available to choose from – how do you decide which stitch to use? Everyone has their own favorites – and your favorites will vary based on the type of project you are planning to crochet. A quick and easy way to add a decorative touch to your crochet work is by using spike stitches. Tatsiana explains a few ways to use spike stitches in her post and she includes photo examples to make it easy to see how changing the placement of your spike stitch can result in a pretty and unique crochet project. 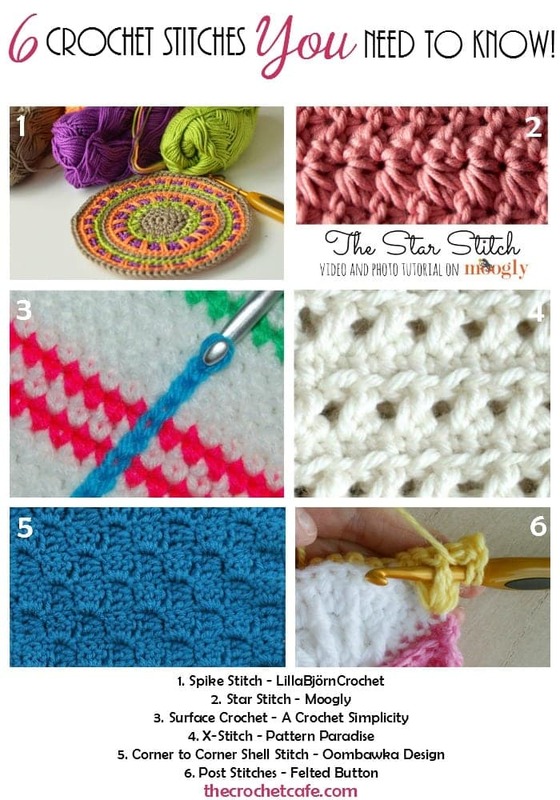 The Star Stitch, also known as the Marguerite Stitch, is a beautiful crochet stitch pattern. This version of the Marguerite Stitch has 5 points and Tamara has created both a video and a photo tutorial to help you recreate the stitch. If you would like to try the Simple Marguerite Stitch (3 point version) instead, Tamara has created a video tutorial for it too. This is definitely a stitch you need to know. You can easily add dimension and design elements to your crochet fabric with surface crochet (or surface slip stitches). You can even make plaid fabric using this technique. Make sure to read Jennifer’s tips about the tension of your surface crochet – these tips will ensure your pretty garment still fits when you are finished adding your special surface crochet details! This X-Stitch is a crossed double crochet stitch. This tutorial will show you 2 different options for the X-Stitch – you can apply this technique to other stitches too (like the sc, hdc, tr, dtr, etc.). It makes a beautiful fabric with lovely texture and you can use it in so many projects. When you visit Maria’s site for the tutorial be sure to see the projects she has made so far this year using this stitch – each month she is producing a new free crochet pattern with the X-Stitch (or a variation of it). Shell stitches are very popular and very pretty! The corner -to-corner shell stitch is worked diagonally from corner to corner; rather than back and forth from edge to edge. This stitch works up very quickly and you can check out both the left-hand photo tutorial and the right-hand photo tutorial on my website. Post stitches are a fantastic way to add extra depth and texture to your stitches and they are SO easy! The only difficult bit is remembering which way to insert your hook around the post of the stitch. Susan’s post provides you with photos to show you how to insert your hook around the posts of the stitch, as well as, some very helpful tips for using post stitches in your projects. In case you did not find what you were looking for in this post, feel free to browse through these additional crochet stitches. I really love the fact that you not only tell, but show. This has made it so easy to follow. Thank you for being willing to help us that are learning (just past basic crochet) this wonderful craft.